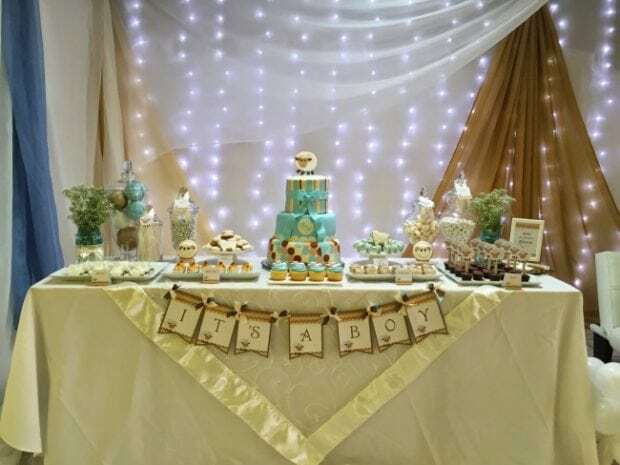 Although the cakes and cupcakes often take center stage, a boy baby shower goes flat without charming decorations. And let’s not forget the games! Make sure you check out all our ideas for unique baby shower games! Have fun looking at all the baby shower themes we’ve showcased. No matter what decorations you’re using, you’ll love these 100+ free boy baby shower printables. Get inspired with these 14 Best Baby Shower Gift Ideas. The sky’s the limit when it comes to the cute factor in these airplane themed boy baby shower decorations. Fabric buntings in shades of blues and browns hung overhead definitely add a fun factor to the table featuring an adorable airplane themed diaper cake. Diaper cakes act as a fun baby shower décor element and great shower gift. 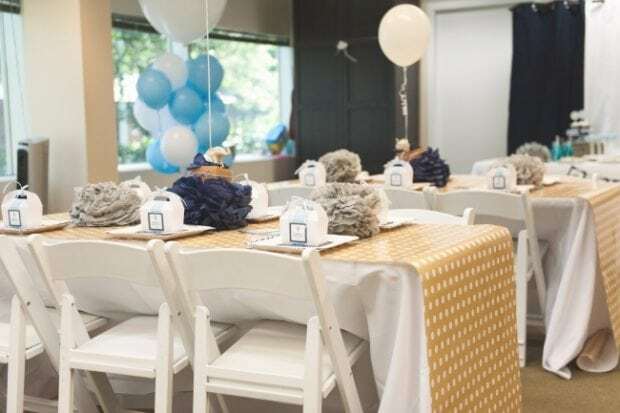 Along the same lines, the clothesline featured in this boy baby shower is full of darling baby boy onesies that coordinate with the color palette and theme of the party. They are a great focal point and make for a great gift for the new momma-to-be! If you zoom in on the photo, you can see the darling airplane clothespins holding up the onesies! Such a darling touch. Welcoming sweet twin boys calls for a sweet boy baby shower. Soft shades of blue and brown pair with stripes, ruffles and birdies to create this darling baby shower theme and dessert table. While the shower celebrates boys, the feminine details like ruffles on the tablecloth, and the bunting on the cake are appreciated by the women in attendance. Tissue poms gave a punch of simple festivity, while simple bird themed printable embellishments added a coordinated look. To bring that down home feel to a country boy themed baby shower, careful thought must be given to the baby shower decorations. You’ll notice blue hydrangeas displayed in tin cans and vases, country chic fabric, plenty of burlap, bandanas and twine used throughout the décor, and a hint of cowboy boots stamped on cards. One budget-friendly backdrop idea featured sheets of scrapbook paper as an easy and colorful table backdrop. You’ll definitely want to stop and gather ideas as you peruse the photos from this country garden boy baby shower! Darling oversized paper flower decorations, daisy and primrose topped cupcakes, fresh blooms, butterfly accents, and pops of blue and white gingham make this a refreshing boy baby shower theme! Plus, the delicious dessert ideas are plentiful, including an adorable cake created to mimic wooden toy blocks. Whooo loves delicious food, charming decorations and an adorable mint colored owl baby shower theme? We do! That’s who! This darling baby shower features adorable printable owl banners, posters, and food labels. The cake boasts the cutest coordinating fondant owl topper, perfectly perched to peer down on an assortment of lovely desserts, salads and lovely shower snacks. Decorations were kept simple and included tissue paper balls hung overhead and a congratulatory banner strung above a lace tablecloth covered table. Classic meets elegant in this beautiful boy baby shower brunch. Some of our favorite baby shower décor elements include the elegant blue rose flower monogram and the installment of pretty parasols hanging from the ceiling. A surprising and fun design element was definitely seeing live goldfish swimming in the vases of floral centerpieces. When decorating for a baby shower, especially one out of doors, and held at night, do not underestimate the ambience created from the addition of twinkling lights and overhead decorations. This Mustache bash boy baby shower features both, and the result is magical! The combination of the lights sparkling in the treetops and colorful tissue poms hanging from branches, creates an atmosphere that is festive and fun. This might just be one of the most clever train themed boy baby shower food displays I’ve ever seen. Imagine a town created of food with a train chugging through via a toy train track & bridge display. The food display winds past french toast casserole, mini quiche, fruit skewers and muffins, with stops at donuts and pastries before the train terminates at cupcake Castle—a scrumptious display of cupcakes, topped with edible icing. This fun retro inspired bun in the oven boy baby shower features so many cute decorating ideas, including fabric buntings and darling treat displays. But the cutest decoration idea of all is a DIY mini oven made from boxes, wooden knobs, CDs and cookie racks. Isn’t it a clever way to serve up cupcakes for the shower? A robot themed boy baby shower is fun and unique, which means coming up with your own decoration ideas can require some extra creativity. We love this robot inspired gift table centerpiece idea. Three different sized blue bins, filled with diapers are arranged into a robot with the addition of paper facial features. What a fun display piece that can be gifted to the new parents-to-be, post shower. Sprinkle the new mama-to-be with an umbrella themed boy baby shower featuring some classic decoration ideas! We just love the clusters of white tissue paper clouds hanging overhead. And how cute are the real umbrellas hanging from the ceiling? The raindrops make for a fun visual display and were cut from cardstock and sewn together prior to hanging from the edges of the umbrellas. Cloud and raindrop paper was used to create an adorable “Baby Boy” bunting, hung from twine and clothespins. Which of these budget-friendly baby shower decoration ideas will you try first? We all know the popularity of rock candy, but have you ever seen it used as a boy baby shower decoration? Check out these rock candy trees that make a dazzling table centerpiece for a baby shower! You could incorporate them into just about any baby shower theme, making them so versatile. This precious gift baby shower features a great way for adding a variety of heights to your dessert or refreshment table when cake stands and serving pieces are limited. Use boxes! In this instance, gift boxes coordinated with the “precious gift” theme as decorations, but they doubled as a great place to display desserts. It’s simple and chic. You can easily wrap boxes with gift wrap to coordinate colors, patterns, styles and textures with your desired look. If you’d like to bring in a vintage feel to your baby shower decorations, this vintage boy baby shower is full of great inspiration! This celebration boasts a gorgeous collection of vintage bird cages, twine balls, Mason jars and old frames. A copper tea set and vintage tea cups and china bring in that olden day charm when friends joined for a cup of tea and shared the latest news. 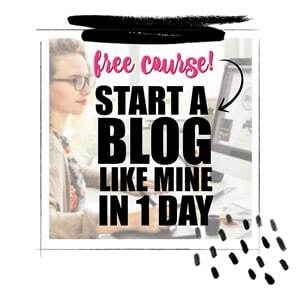 f you’ve ever wondered how to make them, this tutorial teaches you how! You only need a few supplies: tissue paper (in colors of your choice), scissors, glue gun & glue, cord or ribbon for hanging. Cupcake bouquets are a darling way to serve up dessert at a boy baby shower. You get twice the bang for your buck since they are a delicious treat and also function as a cute decoration for your table. To create your own, you’ll need cupcakes, frosting, a piping bag and tip, green tissue paper, flower pot, Styrofoam ball, clear tape, and toothpicks. Check out the tips and tutorial for creating your own cupcake bouquet. 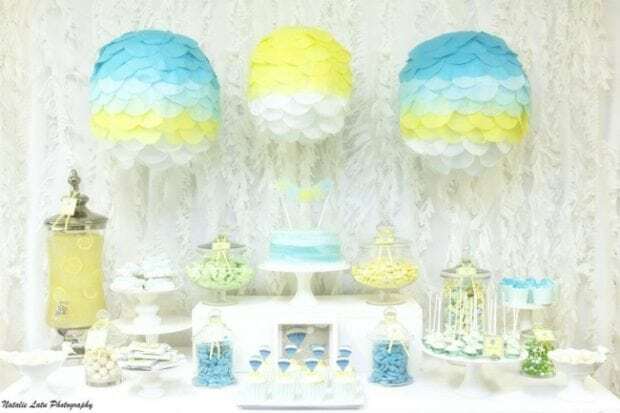 The sky is the limit when it comes to boy baby shower decoration ideas. This creative idea for hot air balloon cupcake centerpieces is a favorite. Think of the cupcake wrapper as the hot air balloon basket, and affix a helium balloon to it by adhering string or curling ribbon to the side of each balloon. Duct tape comes in so many colors, sizes and patterns, making it a fun decoration idea for a baby shower. There are all sorts of uses for colored tape, but we especially love this idea for a mini bunting to adorn beverage glasses. Chris has five additional clever ideas, including decorating the handles of utensils or creating colorful beverage wraps. Here’s a sweet garland to make for a boy baby shower that only requires crepe paper and a pair of scissors. You’ll make one snip of the scissors for each garland, and follow the instructions for folding the crepe paper. Festive crepe paper decorations are well-worth the time you’ll spend folding paper (approximately 5 minutes per garland). Bring in some flowers and DIYd decorative vases as a lovely baby shower decoration. Polka dots and stripes make an appearance at many a baby shower; here’s a simple way to include them on flower bottles (but the same idea could apply to vases and drinking glasses). You’ll need to round up some old juice bottles, colorful flowers, and some fancy tape. 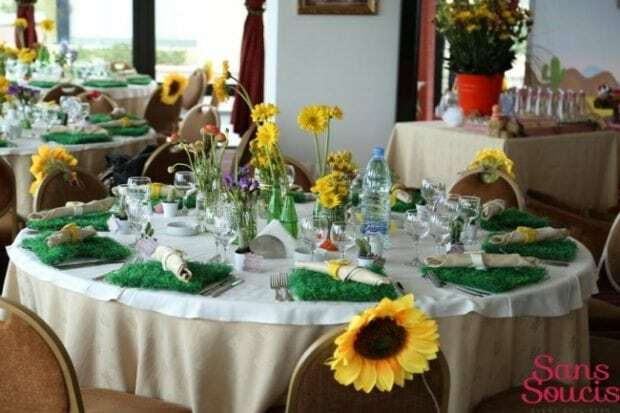 Then you are free to create beautiful floral centerpieces for the party tables. Plus 10 Bonus Boy Baby Shower Decorations on Our Blog!!! If you’re looking for an impressive baby shower decoration idea, here’s a simple and inexpensive backdrop option that adds a lot to the décor: fringed crepe paper. You’ll need to buy the crepe paper in sheets, cut them in strips and then cut through several layers at once. You’ll be hanging this beautiful fringed backdrop in no time. Another fabulous baby shower decoration idea is to use marquee style letters to spell out a name or a greeting. 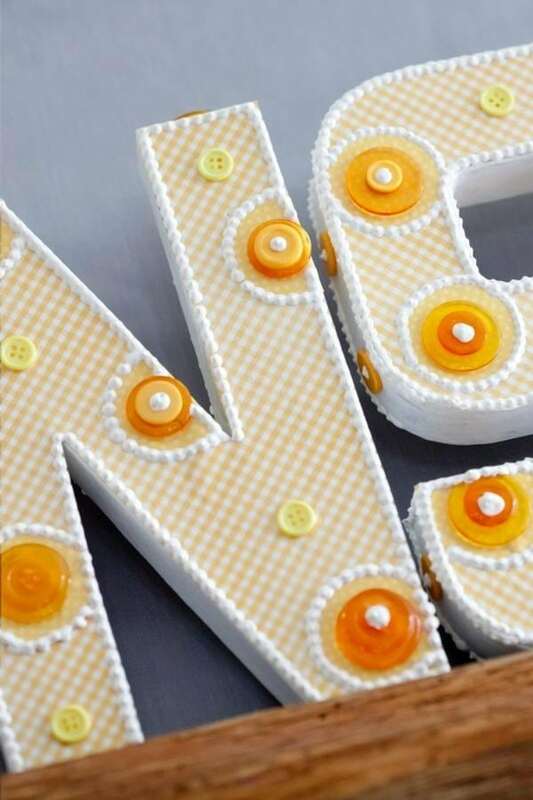 You can decorate the marquee letters to coordinate with the baby shower theme, color palette and overall vibe. The “lil sunshine” letters from this baby shower are adorable and incorporate fabric, dimensional paint and button details. They are such a cute addition to this gender neutral baby shower. Don’t underestimate the effects of lighting as a baby shower décor element. They can create a mood and transform a space almost effortlessly. Plus, almost everyone has twinkle lights in their Christmas stash. You can hang them vertically from a rod and let them shine through an arrangement of sheer curtains, such as in this little lambed themed shower—automatic atmosphere with a touch of glam. Add “wow” to your baby shower decorations by carrying your theme throughout the party. This children’s book theme used favorite titles to inspire the menu. 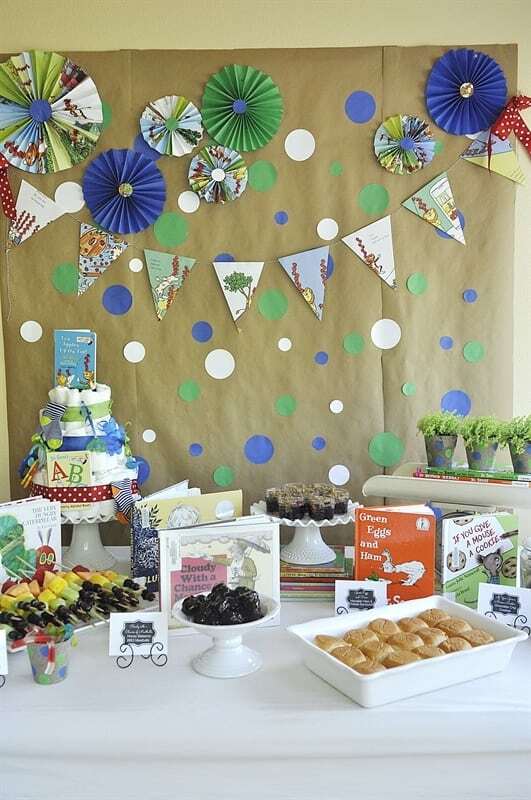 Plus, pages of beloved books were used to create colorful bunting hung for the party. Clever! It’s the details that make a party. Don’t forget to add creative decoration details to your table place settings. We love how faux grass place mats and a few flowers transport guests to the great outdoors, in this bouncing baby buckaroo cowboy themed baby shower. Use an unexpected piece of furniture—in this case, a vintage desk—for a dessert table or beverage display. Furniture can really inspire the feel of the event and is an important décor element. Remember to use a variety of pedestals, boxes and drawers to add charming style. This stunning gender neutral baby shower is a perfect example of how furniture can create a mood. Don’t have matching linens for the tables? No problem! Make an inexpensive table runner with wrapping paper that comes in many colors and patterns. 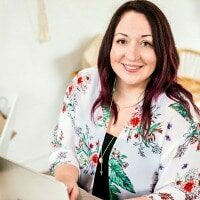 Not only is it a budget-friendly alternative to costly fabric options, it makes cleanup a cinch as you can just throw it away when the baby shower is over. Think you don’t have what it takes to decorate for a baby shower? Repetition of color and form always makes a statement—even with something as simple as soup cans full of flowers. 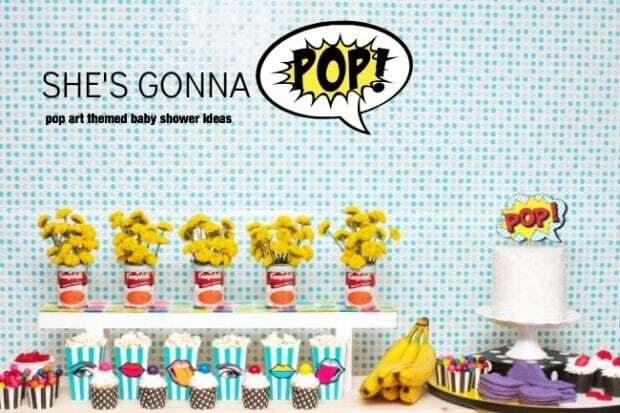 The contemporary mom-to-be will appreciate the pop/art vibe in this “she’s ready to pop” baby shower. If you’re trying to come up with decoration ideas, here’s a tip: choose a meaningful idea and repeat it every way you can. Here, the partnering of the “little peanut” and elephant motif was effective on food medallions, dessert cups, favor bags and décor. 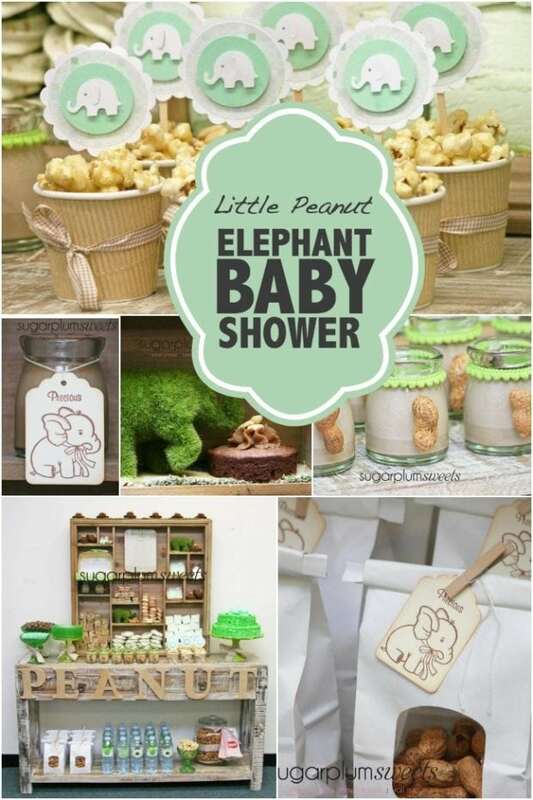 Raid your craft supplies, and look for stamps, paper punches, craft paper and any supplies that you could use to create your own embellishments as seen in this adorable little peanut elephant baby shower. When decorating for a baby shower, try choosing décor items that can do double duty to save effort and expense. 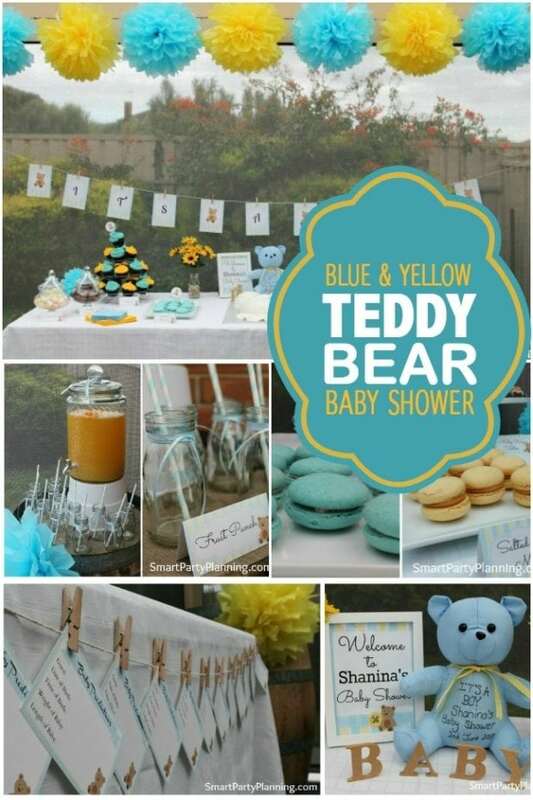 In this blue and yellow teddy bear baby shower, the cute banner actually functions as one of the party activities. The cards in the banner were actually “wishes for baby” and “baby prediction cards” that guests were encouraged to fill out during the party. Another example of décor doing double duty is the sweet teddy bear, which actually functioned as the guest book. Attendees could sign it as a special keepsake.